Captain Sisko marshalls support for his campaign to retake DS9. Back on the station, Kira and Quark try to save Rom while also getting the word out about a troubling development by the Cardassians. We are way... past... sorry. There is no way in the universe I'll ever sleep with you now! Writing: This episode has a lot of set up work to do. It apparently initially started life as a single episode in a five episode arc, but when it came time to break the story, they needed the extra episode. I went back and forth on whether or not I think it's really makes sense to have an episode do what essentially the previous four episodes were supposed to do. In the end, I don't mind since the episode itself is so entertaining. I like that they front Sisko's plan essentially in the teaser. It flags where the episode is going in a good way, and it prevents Starfleet from looking like it was caught with its pants completely down when they get Morn's message. I liked most of the scenes of Sisko advocating for the plan with both Starfleet and Martok. I also like the scene of Sisko talking about Bajor. Sure, it got a little grandiose, but the scene between the two played well. Oddly enough, it was a scene the writers added when they ended up coming up short for two episodes. I'm glad they added it. As long as they avoid the cliche of shooting the guy right after talking about going home after the war, I think it adds some nice emotional color that keeps the war arc from veering too action-y. Matthew: I totally agree with the need for more story telling time. It would have been way too quick to cram this and the resolution all into one episode. I just wish they had spent the time telling more vital portions of the story. This isn't to say that what we got wasn't enjoyable. I just couldn't help being a tad frustrated that side stuff seemed to be emphasized. I think this episode lacked a bit of a central conflict or through-line. As I aver below, I think this should have been either Odo's detachment, Rom's execution, or both. As it is, we get the sorts of scenes that exist either to move characters from one location to another, or set up potential dramatic payoffs down the road (Sisko's Bajor house, Kira's way past sorry with Odo, Dukat is obsessed with Ziyal). Kevin: I will say, as we have said for most of the arc, the station-side stuff really sings, moreso than the Starfleet side. Kira expecting Rom to just be released does seem a bit naive, but it does set up some great dialogue for Weyoun. He has pitched the increased malevolence of the Dominion so gradually, where even here, it's done very subtly, that it's just great to watch. I think my favorite line in the episode might by the offhand "Good for him!" in reference to Sisko's promotion. Dukat's arc is fun too. It's always been clear to some extent that as capable and ruthless as he is, Dukat is basically really, really needy. Be it Sisko or Kira or Ziyal, he needs an audience for his greatness, so instead of feeling like character assassination to have him at least equally obsessed with Ziyal as with the war, it feels like the arc of a Greek tragedy, where the character's basic flaw blows up all over the second act. Matthew: I found the scene in which Kira and Quark confront the Jem'Hadar soldier in front of Odo's quarters to be bizarre, to say the least. Was this supposed to indicate Quark's commitment to saving his brother? It's out of character, but it also just played out in a weird way. The whole "Free Rom aspect of the story was a bit of a time waster, if you ask me, for many of the reasons you indicate. Who thought it would work? Why do we need to hear about it, if they're going to retake the station anyway? If they wanted to push this storyline and have it be purposeful, they should have actually had him walking to the gallows, so to speak (though this would necessitate Leeta scenes, which I do not endorse). Some other odd interludes, which were more enjoyable, were Weyoun's musing on his various congenital deficiencies. Not only does he have poor eyesight and good ears, but he lacks a sense of aesthetics. Is it possible for a race to lack any appreciation for beauty? Do Vorta eat any old ugly slime mold they come across? I enjoyed these scenes mostly for the acting, but they definitely felt like padding. One thing irritated me - when Dukat and Weyoun realize someone has informed Starfleet of their impending destruction of the minefield, no one makes the obvious leap - it was incredibly stupid to leave Kira and Jake to their own devices on the station, especially after Rom was captured trying to sabotage their plan to remove the mines. Kevin: Despite getting six episodes to do it, Odo still has to falter and recover pretty quickly, from a narrative standpoint. That being said, I think the story and the acting give it enough life to succeed. He's obviously enthralled with the Link, but he hasn't completely abandoned his life on the station, and the conflict reads well. There was something about the confrontation in the corridor that really did it for me. I liked the quiet force of Kira's anger and that Odo doesn't even really articulate what he is sorry for. Is it just he's sorry he's hurt her? Does he regret not helping Rom? 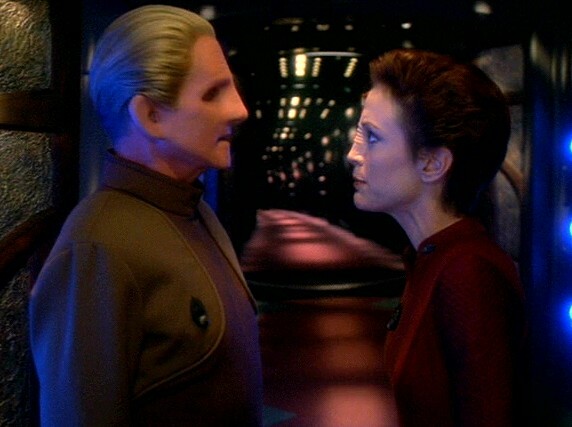 It leaves it a little open where either Odo could see this moment as his wake-up call or his final goodbye to this life. Matthew: This is what I would have preferred the episode focus on, because for my money it's the most interesting part of the story. We know the Federation wants to take back the station. We know Kira wants to undermine the Dominion and facilitate the Federation's return. What we don't know is whether Odo has lost touch with his humanoid friends for good. We are given hints of his doubts, but they are not dramatized well enough for my taste. Leaving things open to interpretation is one thing. But this was just underdone storytelling. Kevin: Everyone does a really job, I think, but I don't have a lot of specific praise, which itself kind of a compliment. None of it is Shakespeare, but everything is taut, economical and competently executed and serves the tension the episode needs to have to make the final episode in the arc work. I will single out Combs again, though. Every single line is a work of art. Matthew: I think overall it turns out these last two episodes have been about Odo in a significant way. I wish the episodes would have given Rene Auberjonois more to work with, because he is excellent in his scenes. I enjoyed the scenes between Marc Alaimo and Melanie Smith, although she was perhaps a bit shouty. Alaimo's Dukat was excellent, though. Chase Masterson whimpering and whining... I'm not even going to say it. Kevin: The show is pretty much a bottle show. The opening battle sequence was well done, overall. I liked a lot of the detail work on the ships and the brief battle had a nice arc to it. The only other big effects shot was the fleet assembling at the end, and that's always fun. I liked the trick of small bursts of light out the window for the mines being deactivated. It's a nice workaround that both saves work and enhances the story by letting the conversation continue between Dukat and Weyoun. Matthew: I think they did a really nice job with the sets on the station. It really made it feel like a true place, not just a scene backdrop. There were subtle cues, like the exterior model shot that panned to a lower section of the station. I'm going to talk about this more next time, but while the fleet shots are fun to look at, they are a bit crowded if you ask me. How is any ship supposed to combat any other, when it's surrounded in three dimensional space on practically all sides? It renders the ships in the middle practically useless. Anyone who has played Homeworld can back me up on this. You want your capital ships either in a line or a wedge, not in a blob, so they can fire their weapons in all directions. Kevin: I am this close to giving a 4, but I think I am going to stick with the three. It is a solid and entertaining episode of television and it sets the board nicely for the next one, but it's still just set up. I will say it left me very eager to see next week's episode when I first saw it, so it certainly did its job well. Matthew: I've been criticizing, but I agree on the basic entertainment value. This hodge-podge of scenes ends up all being pretty good, even if they lack some cohesion. It's true that the only points made tend to be plot maintenance ones. But at least this episode had a point with respect to the overall plot, unlike last episode's unfortunate Alexander Rozhenko interlude. The lack of a cohesive dramatic spine keeps this entirely out of 4 territory for me, but I agree with the 3 for a total of 6. We get to this is our forthcoming review of Sacrifice of Angels. The episodes are good, but individually suffer from each trying to a bit too much or one side of the story, usually the Starfleet side, aren't as tight as it could be, but collectively, the opening arc is definitely more than the sum of its parts. If we were giving a separate rating to the collection, it would be higher than the individual numbers would suggest. That is kind of the deeper issue of "Deep Space 9", the strength of it is not the individual episodes but how well they hang together in a collective whole. DS9 is a better series, TNG has better episodes. Well, I disagree that by themselves these individual episodes are sort of merely average and leave some to be desired. .Just because they are part of a larger arc, does not mean by themselves and thus individually they suffer narrative deficits or simply are not very good episodes. DS9 tells completely different stories than TNG. It is more political and cerebral, less exploration and sci fi (or it has sci fi embedded in the larger political narratives) That is just the nature of the show, it doesnt mean it is lacking. In fact, that we do get something different, a different approach and insight into the Trek universe, one that is not merely just concerned with 'going where no man has gone before', actually gives more dimension and depth to both the franchise as well as the universe as imagined by Star Trek in general. I am glad that DS9 deals with the universe it inhabits differently; that is treats i and imagines it and narrates it differently than TOS, TNG, VOY and even ENT. I wouldnt have wanted to see 5 Trek shows all dealing with the same aspects of the Federation and life in Starfleet, only at different locations. This is all part of the beauty of Trek (which is why comparisons of Trek shows with each other always strike me as odd because, after all, each show is telling a different story and looking at the universe from a different angle. It is a big place). So statements that DS9 is a better series while TNG has better episodes strike me as incredibly simplistic because it disregards the different nature of each show. I would not say that the shows individually are deficient because they are part of the arc. I would just say they are deficient in enough ways to not make them terrific episodes regardless of their status as parts of a whole, whereas the arc as a whole is more enjoyable than any of its parts. There were just lots of inconsistencies and/or half-baked ideas in perhaps half of the plot lines overall. I totally agree that DS9 has a unique and worthy place in the Trek universe. I just think there are better episodes that tackle it ("Siege of AR-558" and "Statistical Probabilities" spring to mind).